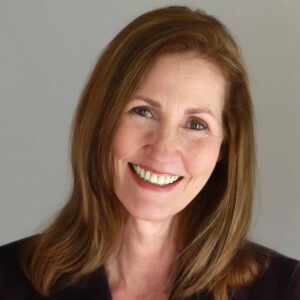 Home / Everyone In Harmony / Guest blog: The impact of the male singing experience, shared with everyone – Debra LynnBecome A Member! Recently, in an impromptu Facebook video post, guest blogger Debra Lynn shared her thoughts about why the male-only chorus and quartet structure is so important to preserve. Her personal story and observations closely align with our core mission and provide particular insight into why we are so committed to both preserving the male singing experience and exploring ways to become a more fully inclusive organization. We asked her to share her story and perspective. My Dad was a Barbershopper in The Coastmen in the early 1960s, at the time directed by Harlan Wilson and Gene Cokeroft. He was profoundly impacted by the chorus’s District Championship win during that period, later going on to sing with the Silk City Chorus under Vin Zito, after relocating our family to Connecticut for job reasons. This career move ultimately led him away from singing on the risers, so by the time that I was an adult, he had long let go of his Monday night rehearsals. My father didn’t have an easy life, for reasons only he knows. This very private man, highly accomplished within the aeronautical industry, was acclaimed in Aviation News for inventing the Vector nozzle, an aviation game-changer. But even with that success, inner peace and joy eluded him. If I had known twenty years ago what being on the risers could do for the emotional well-being of a man, I would have dragged him back into a chorus lickety-split! Men around the world are struggling. We see it on the evening news every single day. Abuse, horror, violence, these are things that happen when the hearts of men are wounded and lost. A wise teacher once said to me, “there is no greater task than that of easing the suffering of mankind.” Barbershop harmony does exactly that, every week, in every chapter, on every set of risers. Whether male or female, whether in the Barbershop Harmony Society, or Sweet Adelines International, or in Harmony, Inc., we do this through the gift of song and four-part harmony, which requires us to play together as a synchronized team, a rare accomplishment in the world of agreement. While focusing on this expansive vision, I believe it’s also possible to maintain the original integrity of this men’s organization. Not only is it important to preserve the unique sound that male-only quartets and choruses generate, but also to preserve the sanctity of men’s chapters, where men are able to rely on each other in fellowship and brotherhood. I’ve witnessed the power of male mentorship, where younger men navigating into adulthood have been encouraged and supported by men with a few more years of life and work experience. This unique multi-generational environment offers benefits beyond the risers, and plays out in the healthy family dynamics that we see throughout the Society. 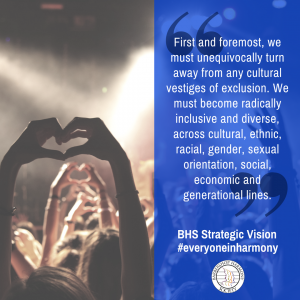 I believe that through the addition of the BHS Inclusion Statement, we are opening our minds to an added third pathway, where major issues of gender, religious, sexual orientation, and ethnic inequality can be mitigated and transformed, as we impact our world through barbershop singing. For example, by supporting Mixed Barbershop Chorus and Quartet opportunities, we add a new dimension — not only to our singing experience, but also to our world view. I envision that we will become a culture noted for embracing people, and facilitate playing together in new and expansive ways. We in essence create a win/win, where each of us gets to choose how we want to participate, and on which team. The fact that a men’s organization is leading the way with this cutting-edge consciousness is profound on so many levels. I have long believed that well-tuned barbershop harmony is spiritually important to our world. As many long-time members are aware, we are doing much more than singing together, we are transforming people’s lives in a fundamental and, perhaps, critical way. Change can be challenging to navigate, but when we recognize the great emotional need that exists around us in society, and the unique opportunity barbershop singing offers, our unified focus can be on exponential impact. Ending apparent separation between us will ultimately heal the disheartened soul of this world. Maybe this kind of lofty goal won’t be fulfilled in my lifetime, but through sustained harmony, it will happen. Since my publication in The Harmonizer in 2010, the Barbershop Harmony Society and many colleagues I cherish have helped to shift the course of my life, giving me meaningful purpose and direction, as I offer my understanding in service to men like my Dad. My heart will never forget that I wasn’t able to give this gift of barbershop back to him, but I do have the ability to share barbershop singing with everyone I meet going forward. Who knows how harmony will change their world? Although we may never know, I suspect it will change it, for the betterment of all. Debra Lynn is the author of Bel Canto Buzz: Beautiful Singing Made Simple! and the “Sing Like an Italian” and “Breathe Life into Your Singing” articles in The Harmonizer. She has served on the faculty of Harmony University and many District, Regional and International level events. ← Why YOU Should Attend the 2018 Leadership Summit!